Sam Semoff died peacefully on 11 Jan in the Royal Liverpool Hospital after a long illness. Hundreds of us in Liverpool and elsewhere knew him as a friend and comrade. He was warm, intense, committed, and ready to engage with anyone he met. He lived in Liverpool 8 (Toxteth) as an American in exile, an anti-racist, lifelong opponent of Zionism and supporter of the Palestinian people. We knew each other best through his work in defence of the NHS. As a founder member of Keep Our NHS Public Merseyside, Sam continued chairing meetings even while carrying an oxygen bottle and undergoing dialysis. No-one – porter, domestic, nurse, medic or Consultant - got within a few feet of Sam in hospital without being asked their attitude to the Private Finance Initiative (PFI), or the latest government plans to undermine the NHS. During the Junior Doctors strike, he persuaded staff to let him appear at the Atrium window above the demonstration in the ambulance forecourt. Sam phoned through to a mobile pressed to the megaphone and addressed the strikers. “Good morning everybody. I am a patient on the Cardiology ward here in the Royal. I’ve been in here two weeks and I can tell you the care has been absolutely great. 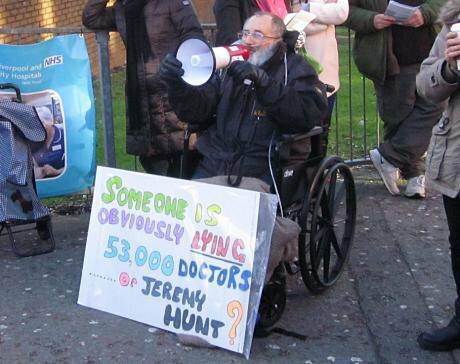 Jeremy Hunt is a liar – he says we need a 24/7 service, well we have 24/7 service. I have been in here two weekends and a doctor was always available, so were support services. Hunt is also a hypocrite – he talks about patient safety, yet he wants to remove requirements that limit junior doctors working unsafe hours, putting patients’ lives at risk. The doctors went into medicine to help people, their main concern is their patients’ needs above all else... Hunt knows this and takes advantage of it, he thinks he can push them to the limit and they will not do anything. But they have said enough is enough, they know the risks to their patients in going along with Hunt’s proposals are greater than doing nothing. I wish a lot more health workers would reach that point. The Government is determined to decimate the NHS and turn it into a market-based health care system like in America. They have eroded the principles of universality, of a comprehensive integrated service that is publicly accountable, and they are now working to undermine publicly provided, as the NHS is broken up into bits and turned over to the private sector where the overriding aim is profit. When they get around to removing the principle of a service free at the point of delivery based on need, it will be too late. I hope to see you out here next week and the week after. Sam had been a community health activist for decades, as Katy Gardner reminded me. He was a patient at Princes Park Health Centre from the early 80s, when Dr Cyril Taylor was still practicing. Princes Park was more than a health centre, and Sam shared its philosophy of holistic health – treating the whole person in their community setting. It housed a library, with art and poetry in the waiting room. It was connected into the community through the Toxteth Health Forum. Sam was instrumental in setting up the Forum, based in Lodge Lane. He edited its newspaper “Voices”, distributed door to door in Liverpool 8. Katy Gardner, then a GP at Princes Park, wrote a regular column. The paper reported on the Community Health Council and gave space to all types of local health groups. Toxteth Health Forum lasted 10 years, until the money dried up. Sam turned his energy to setting up the Somali mental health project, MAAN. This aimed to raise the profile of mental health and bridge the gap between the community and the mental health institutions – which knew little of the Somali community. It transformed the way the community viewed mental health, breaking the taboo, and educated the mental health trust. MAAN workers accompanied GPs on patient visits. Eventually the grants ran out, despite Sam's best efforts. Meanwhile he volunteered, helping Somali women with welfare rights. Sam worked with Katy on a proposed study at Princes Park, to explore why Somali women were not taking their blood pressure medication and why health workers didn't appreciate or understand the reasons. Eventually, he got ethical approval for the research, only to be overtaken by his own illness. To top it off, NHS England handed the management of a dozen Liverpool surgeries, including Princes Park, to the private firm SSP. That wasn't just an affront to Sam's politics. It was personal. Sam hit back with 10,000 leaflets in Arabic, English and Somali, delivered door to door and to every shop on Lodge Lane. He had been Secretary of Granby Ward Labour Party, and ran this like an election campaign. It culminated in a public meeting of around 130, almost all of whom were current or former patients at Princes Park, furious at how the service had collapsed. It was held in three languages with interpreters and a two-way PA, allowing Somali women who sat with their friends in a side room to hear and address the entire gathering. The meeting led directly to a survey, a report, and the intervention of the Care Quality Commission which eventually kicked SSP out of Liverpool, though some NHS staff were victimised in the process. Sam led the fight against PFI funding for the new Royal Hospital. The Liverpool Echo vilified him with the scurrilous headline “Bogoff Semoff”, claiming that an American was trying to deny healthcare to the people of Liverpool. No-one ever apologised for that, even when the newspaper finally woke up to the PFI catastrophes at Whiston Hospital and around the country. Sam brought a Judicial Review which forced the Royal to re-run their consultation as they had not even mentioned that the new hospital would be funded by PFI. Every Liverpool Labour MP backed the scheme, as did Councillors ick Small and Joe Anderson, at that time leader of the Labour group within the Council. The Royal PFI was signed off by Andy Burnham as Health Secretary on the eve of the 2010 General Election. Sam lodged a second Judicial Review, challenging the claim that the PFI would deliver Value for Money. On 17 Nov 2010 BBC Radio Merseyside put Sam up against Joe Anderson, who angrily declared "I know it doesn't provide Value for Money now or in the future, but it's the only game in town". That admission ricocheted all the way up to a Treasury Select Committee Inquiry into PFI. But the JR was derailed when Councillor Small approached the Legal Assistance Board and got them to pull the funding for Sam's challenge. When the news of his death came through, a demo at the Health and Wellbeing Board turned into a tribute to Sam. We all miss him. Let's honour him by continuing the fight.